Tokyo Girls Collection (TGC) 2010 A/W, one of the biggest girl’s clothing fashion shows in Japan, was held yesterday at Saitama Super Arena, and attracted 30,000 audiences. The show presents the latest everyday fashions, and since it is linked with e-commerce, the audiences can purchase what the models wear on the runway real time. This is the stage. 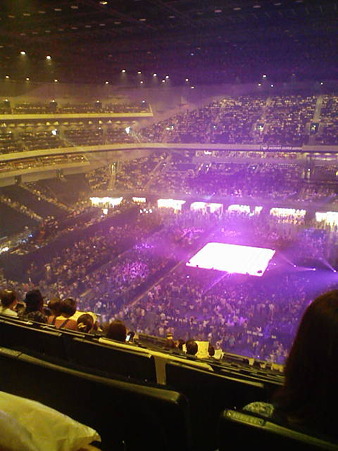 The audiences sitting far from the stage may not be able to see the clothes but they look at a giant screen there. For this season, 80 models walked the runway wearing the latest autumn and winter fashion presented by 22 brands. Having themed “Back to the Classic Future,” TGC aimed to look back at the roots of the brands and express them for the future. The keys for the season are military style, Nordic style, and fur, which were seen on the runway a lot. You can see pictures at Yomiuri Online. From spring 2011, TGC will be held in Beijing too! The show has been held in Beijing twice but they were for the industry. This time, it will be the first TGC Beijing for the public.